It seems like talented actor/director Woody Allen really is Mr. Teflon. The scandals that have plagued his personal life over the years would have been enough to bring other filmmaker’s careers crashing down around them. They would have become box office poison and eventually been shunned by film studios right around the world. That certainly hasn’t happened with Allen though who has instead just merrily gone about his business churning out at least one film a year for as long as I can remember. The good thing about that though is that even with age the level of greatness he has managed to bring to each of his films has never dropped. Over recent years he has proved that with films such as To Rome With Love, Midnight In Paris and Vicky Cristina Barcelona which have all been absolute gems. With a rich family, including young Brice (Hamish Linklater), believing every word that Sophie says and now giving her money for her services Stanley’s good friend Howard (Simon McBurney) demands that he investigates her. Not only does Allen make sure the set design for this period is absolutely spot on but he has also delivered a film that almost feels like it was made back in these times as well. A time when filmmakers knew that a good script and some great acting were far more important to the audience then special effects or the like. In fact if Allen had filmed Magic In The Moonlight in the black-and-white you could have been excused for thinking the film was a re-born classic. Yes, this isn’t the kind of film that you want to watch in the latest multiplex cinema, to get the true beauty of this film you really need to hunt down the oldest theatre in your city and go watch it there. Having praised Mr. Allen to high heaven though it is worth pointing out that Magic In The Moonlight is not one of his finest films, but then even an ordinary Woody Allen film is usually better than most films out at the time. 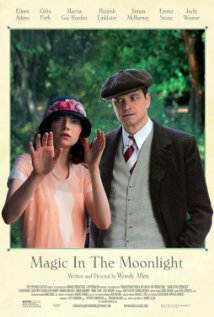 Still Magic In The Moonlight does have all the things that a true Allen fan looks for his films – the witty dialogue, the big twist and an air of mystery that only the masters of old can manage to create. But there is one big weakness with Magic In The Moonlight, and that is the romance element. It does work and despite some fears that whole idea of Colin Firth and Emma Stone coming together isn’t as gag worthy as what we had to sit through with Zeta-Jones and Connery in Entrapment, but the romantic element of the film seems to be the only reason that the last quarter of the film has been tacked on. Once the big reveal happens the romance seems unnecessary and as a result the ending of the film drags a little as all the suspense has already dissipated. Just like all of Allen’s films though, he gets the best out of his cast. As usual Colin Firth is smooth and seems to enjoy the opportunity of delivering some of the catty lines that Allen’s script contains. At times it does feel like the screenplay has called upon Firth to almost parody the a 1920s gentlemen and he seems to do that well. He is also well supported by Emma Stone who seems to keep being able to silence her critics who cruelly suggest that she has better looks than talent. While she doesn’t exactly steal the show like she did in Easy A she again shows that she can move between comedy and drama in a heartbeat with ease. Magic In The Moonlight is far from one of Woody Allen’s best films. The romance coming to the fore towards the end does let it down a little, but for the most part it does work. Just be warned that the film is aimed for an older demographic so if you are a little on the younger side this may not be the film for you. Other Subculture Entertainment Reviews of ‘Magic In The Moonlight′: For our full Magic In The Moonlight review please check The Good The Bad The Ugly Film Show Ep #94. You can also read Dave’s Magic In The Moonlight review on The Book The Film The T-Shirt.